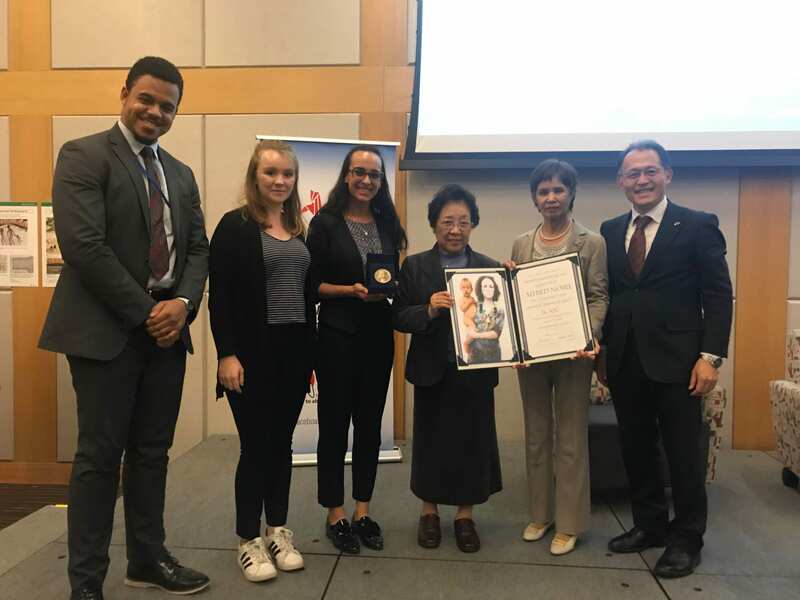 Pace University students (left to right) Seneca Forch ’19, Laken Fournier ’21 and Mary-Lynn Hearn ’19 meet with Hiroshima atomic bombing survivors, Tsukamoto Michiko and Sora Tamiko, and Akira Kawasaki of Peace Boat, at Rutgers University, 29 October 2018. They are holding the 2017 Nobel Peace Prize medal and diploma awarded to the International Campaign to Abolish Nuclear Weapons (ICAN), of which Peace Boat is an international steering group member. Pace University students provided almost 470 hours of volunteer service to 12 civil society organizations engaging in humanitarian and human rights advocacy in and around UN policy discussions on global peace and security in Fall 2019 semester. Enrolled in POL297L Global Politics of Disarmament and Arms Control, 22 undergraduate students were given 20-hour service learning placements with international non-governmental organizations (NGOs) working at the UN, to fulfill the civic engagement requirement of Pace’s core curriculum. The class also counted for the Political Science and Peace and Justice Studies majors. The focus of the students’ assignments was the UN General Assembly First Committee, in which the almost 200 member governments debated matters of disarmament and international security, October to November 2019, drafting resolutions for consideration by the General Assembly’s plenary. Students monitored the debates, taking notes on statements, helping to organize logistics for lunchtime panel discussions, taking photographs, writing news articles and grant proposals, conducting research and assisting with social media messaging. Director of Pace University’s International Disarmament Institute Matthew Bolton chaired a side event on positive obligations at the UN 31 March 2017 during the first round of negotiations on a nuclear weapons ban treaty. The panel featured Richard Moyes, Managing Director of Article 36, presenting research on stockpile destruction; Bonnie Docherty of the Harvard Law School International Human Rights Clinic presenting research on environmental remediation; and Erin Hunt of Mines Action Canada offering insight into how victim assistance provisions might function. Dr. Bolton highlighted research by the International Disarmament Institute on possible educational provisions in the treaty. 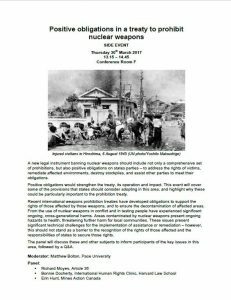 In preparation for the side event he also published an article in the Nuclear Ban Daily on precedents for positive obligations in humanitarian disarmament treaties. 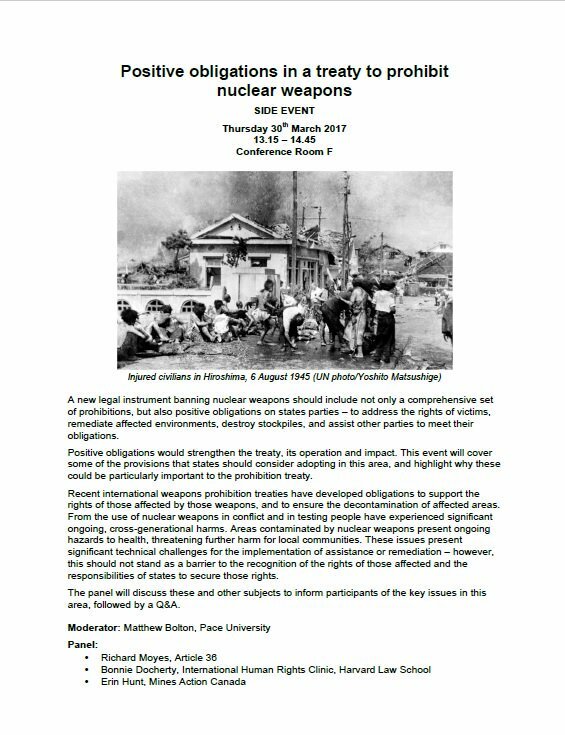 For further information on the side event, read the write-up from Article 36’s Elizabeth Minor.